Compared to every other form of communication platforms, SMS is extremely easy to set up. Affordable to start, manage and maintain. SMS marketing is affordable, easy to manage and simplify. When it comes to getting higher audience engagement; perhaps no other platform can Enhance Audience Engagement like SMS does with the help of short and simple messaging service. SMS can be sent to literally any mobile device; thereby making the process of sending the communication advertisements easy across a variety of mobile devices. Apart from the features mentioned; SMS Marketing by BroadNet is helpful since it helps deliver distinct, personalized and simplified messages when other forms of marketing communication are very much dependent on a simplistic set of messaging that is not always personalized. How to use the full potential of SMS to promote live events and concerts? 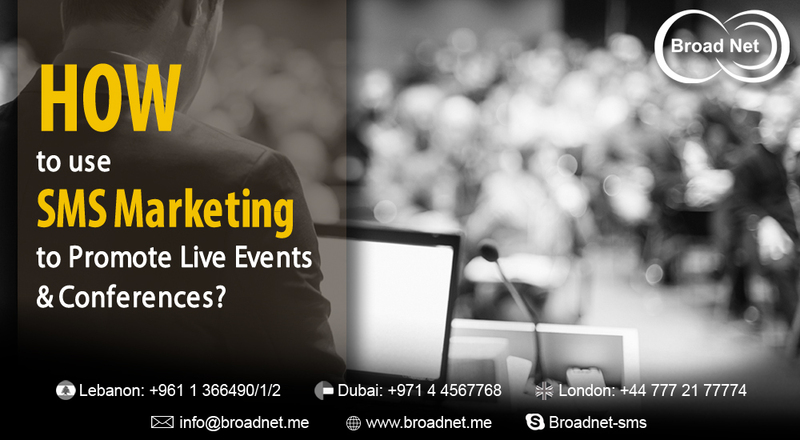 Now, talking about the topic of our today's discussion; when it comes to promoting live events and concerts; BroadNet’s SMS Services can be used as a highly important tool. It can be used as instant message supplier to targeted set of audience in real time. It can be used to let target audience keep in touch with the progress and status of an event. It engages audience, makes them happily connected and even rectifies a message if needed. Using SMS, organizers can even get feedback about the planning of a conference and events. Ask question and answer in a livelier fashion. For example, reaching out to a speaker during an event might not be easy for an audience; but using SMS that speaker easily be reached. Making great events successful very often depends on the usefulness of messages attendees receive through messaging platforms.